Vern Pachal first displayed his impressive skills as a hockey player while still a young boy in his hometown of Yorkton. He led three Yorkton teams to provincial championships—at the Pee Wee level in 1943, the Bantam level in 1945, and the Midget level in 1947. 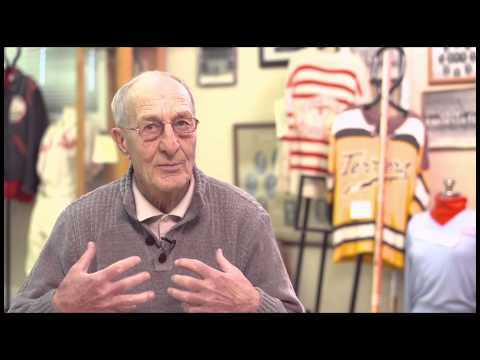 From 1948 to 1951, Pachal played in the Western Canadian Junior Hockey League. As a center with the Crows Nest Pass Lions in 1949/50, he won the Harper Perry-Charlie Meadows trophy as the league’s leading scorer with 59 goals and 47 assists. He was the runner-up for the same honor the following season. Pachal joined the Springfield Indians of the Eastern Hockey League in 1951. In his two seasons with the team, he finished in the top three in league scoring, and made the All-Star Team each season. In 1956, Pachal began attending the University of Alberta. He joined the Golden Bears hockey team, where he quickly established himself as one of the best players in Canadian University Hockey. In three seasons with the team he scored 169 points, an average of 3.97 points per game. He set Canada West University Athletics Association records in career points, points in a single season (58 points in a ten-game season—a record that stood until 1986 by which time a university hockey season had stretched to thirty-eight games), and points in a single game. In 1958, after his final season with the team, he was awarded the Wilson Challenge Trophy as the University of Alberta’s male athlete-of-the-year. After a year playing overseas in the British Ice Hockey League, Pachal returned to his hometown to work as a teacher. He rejoined the Saskatchewan Senior Hockey League’s (SSHL) Yorkton Senior Terriers. As captain and team manager in 1961, he was named the SSHL’s Most Valuable Player, thanks to a strong 56-point season. Vern would have his best season with the Terriers in 1963, scoring 40 goals and 40 assists. He continued playing hockey in competitive “Old-Timer’s” leagues right up until 2006. In addition to his achievements as a player, Pachal has made a lasting contribution to sport and recreation in the Yorkton area. He has coached, chaired committees, planned events, written histories of local teams and even helped establish the Yorkton Sports Hall of Fame.